Captain Aaron Ramsey says there is still room for improvement despite Wales' 1-0 win in Bulgaria. Gareth Bale's deflected shot at the end of the first half secured victory in Wales' final match of the Euro 2012 qualifying campaign. "There's definitely room for improvement from everyone," said Ramsey. "Just because we've got this win we're not going to sit on this one." Three wins in the final four games of the campaign saw Gary Speed's side finish fourth in Group G.
And Arsenal midfielder Ramsey admits there is plenty of work still ahead of the national side before the World Cup qualifying campaign begins next September. 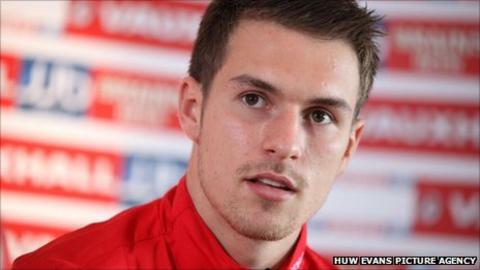 "We want to improve and we'll work on our weaknesses and hopefully we can take that into the next game," Ramsey added. "The manager and his staff will sit down and watch the video and we'll pick up on them and we'll improve. "We want to keep the momentum going and keep ticking off things as we go along." The victory in Sofia gave Wales their first back-to-back wins in competitive matches for six years and Ramsey said his side were worthy winners. "I thought we showed some great character," said Ramsey. "I think we deserved the result in the end. "We're delighted with the result. We've had two back-to-back wins now and we're progressing really nicely. "The dressing room is buzzing and the lads are all happy with the way things are going. "They've grown into the role and into the style of play that we want to play. I can't wait to get back out there for Wales again." Ramsey wants Liverpool striker Craig Bellamy, who won his 66th cap in Sofia, to prolong his international career. "He's a great player and a big player for us and one who has a lot of experience," said Ramsey. "He brings pace down the left wing for us and has the ability to come in and score goals and create opportunities for us. "We want to keep him for as long as possible."